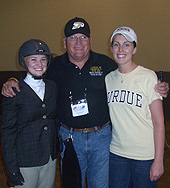 Purdue University Head Coach Jerry Steinmetz (center) had one undergraduate and one alumni rider entered at 2010 IHSA Nationals. While Boilermaker sophomore Ashley Arend (on left) finished out of the ribbons in individual novice flat, 2009 graduate Laura Lemanski (on right) finished third in both hunter seat alumni divisions. Steinmetz was extremely proud of Zone 9 alumni in general, as a pair of Region 2 riders (not pictured) walked off with the blue ribbons. May 6th was a busy day for Indiana University senior Grace Golan (pictured). 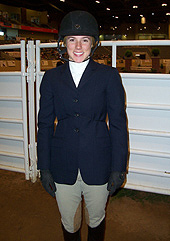 Golan was sixth in individual intermediate over fences at 2010 IHSA Nationals in Lexington, Kentucky to start the day, then placed eighth in individual intermediate on the flat four classes later. Schools competing in Zone 9, Region 1 during the 2009-2010 school year: Ball State University, Butler University, DePauw University, Earlham College, Eastern Illinois University, Indiana University, Indiana University - Purdue University at Fort Wayne, Parkland College, Purdue University, Purdue University at Calumet, St. Mary of the Woods College, Taylor University, University of Illinois, University of Indianapolis and University of Notre Dame/Saint Mary's College (IN).